ST. GEORGE – Police said failure to yield was to blame for a crash that backed up traffic at the intersection of River Road and Riverside Drive Friday afternoon. 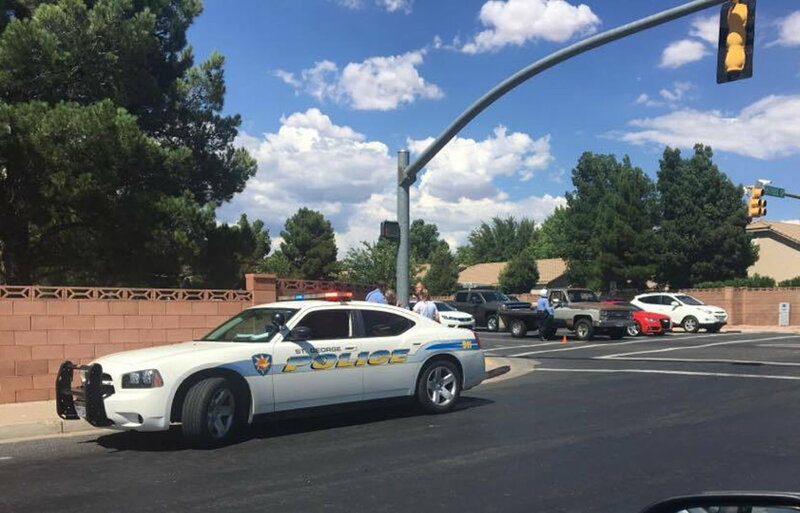 Around 3:10 p.m., St. George Police officers were dispatched to the intersection following a T-bone collision involving a Honda minivan and an SUV. The minivan was in the left-turn lane on River Road waiting to turn west onto Riverside Drive, while the SUV was southbound on River Road. Both the minivan and SUV entered the intersection on a yellow light, St. George Police Officer Dave McDaniel said. “Nobody was really paying attention after they saw it go yellow,” McDaniel said. There was some initial confusion as to whether the collision occurred before or after the light turned red. A witness as the scene was also unable to tell police if the light had changed when the vehicles collided. Ultimately the collision was seen as a failure-to-yield incident, with the driver of the minivan receiving a citation, McDaniel said. Both vehicles were towed from the scene, and no injuries were reported. Failure to yield tends to be the primary cause of the majority of the collisions McDaniel responds to, he said, followed by drivers following too close. Traffic attempting to pass through the intersection was partially blocked, with some motorists passing through the parking lot on the southwest corner of the intersection in order to turn west onto Riverside Drive from northbound River Road. The St. George Fire Department also responded to the scene. Based on the photo of the SUV, his windows were so dirty, he couldn’t see anything anyway. He would have had better viz in a submarine. frickin idiot. he should’ve got a citation for obstructed view and for being a dimwit. I’d put $$ on it being a trump voter. as to whose fault it was. who knows, with so many clueless idiot drivers in this town.